For those of you who have been with me long enough to work your way through 30 Days of Brain Play you’ve probably noticed activity #25: Go on a Treasure Hunt. Even though I included tips for creating your own treasure hunt, my plan was to come back and provide you with a ready-made template of clues for you. That way you wouldn’t need to start from scratch and create your own. Then I went in search of clue ideas. 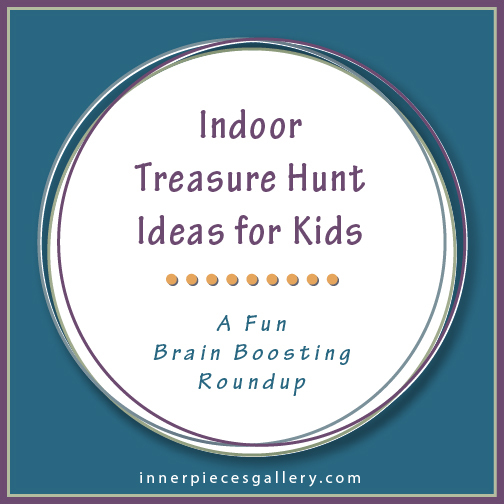 Holy moly, did I find a treasure trove (pun intended) of really creative scavenger hunts and treasure hunts for kids! Since it makes no sense for me to recreate the wheel here, I decided to round up a few of my favorite ideas and done-for-you clues. Mind you, some of the information in this roundup has been around for a while, so please ignore the dates. Fun never really has an expiration date, right? Click the links below for more details and to discover which hunt is the best fit for your kiddos. Katrena over at Wildflower Bouquets has a whole category of scavenger hunt ideas worth exploring. I particularly like Hunt #4 because it includes an alphabet code. The code must be cracked in order to find the next clue! Joyce at Childhood Beckons may have designed this one to include counting practice, but I love it more for the puzzle pieces. Each clue leads to 10 puzzle pieces of a 100 piece puzzle. You can choose a larger or smaller puzzle, of course. Once your child finds all 10 clues, the reward is solving the puzzle! This one from Ness at One Perfect Day is a good fit for younger children who aren’t reading yet. No written clues are involved. It requires a little prep work on your part, but it’s a fun, clever way to incorporate map skills and strengthen spatial awareness. Even though Amy at Super Healthy Kids calls this one Easter themed, you really don’t have to hide the clues inside little plastic Easter eggs. Even better news, the fun rhyming clues that get kids up and moving are all provided for you. Sara at Brainstorm in Bloom gives us 5 illustrated, pirate themed clues for a true treasure hunt. If you’re looking for a low-prep, short and sweet treasure hunt, this is the one. Sweet, because the final clue takes kids to the freezer! What you decide to leave in there for them there is up to you. Did you notice that 4 of the 5 treasure hunts I chose include an additional learning component? Beyond all of the required detective work, that is. As long as we’re all having fun, we might as well be learning, too! If you’re “hunting” for even more learning activities for kids, sign in or sign up for The Free Printables Collection. You’ll find more than 50 learning powered printables already waiting for you now.